Dozens of cities globally, including New York, began monitoring gunshot sounds with sophisticated rooftop sensor technology that measured two to three feet in length more than a year ago. However, newer sensors to detect gunshot sounds that are being tested by L.A. are smaller, about 1.5 inches in diameter, and can be placed farther apart, on a light pole every 10 blocks, according to Ed Ebrahimian, director of the city's bureau of street lighting. These gunshot detection sensors are being tested on some of the 25,000 poles that already have wireless controllers installed for turning city streetlights on and off remotely and for monitoring, he said. "Now we're taking the next step with gunshot detection sensors and working closely with Philips," the manufacturer, he said. Los Angeles has launched a pilot project to add sensors for noise, including gunshot sounds, to streetlamps where wireless controls have already been installed. "We can easily connect [the gunshot information] with 911 and instantly detect gunshots in high crime areas," Ebrahimian said. "With 911, we can send police cars to a location in minutes. If we can send a car five minutes earlier and save someone's life, we've done our job." The light pole controllers can also be equipped with inexpensive sensors for general noise levels and have been tested successfully next to an elementary school where peaks in noise were detected when school children were outside. Sensors to detect earthquake tremors, pollution and moisture are also under consideration, Ebrahimian said. "Our first phase is to have sensors without cameras, but really the sky's the limit" on what can be detected, he said. L.A. police already use cameras in high crime areas, but that information is handled on a separate network infrastructure from the city's streetlight network, he said. 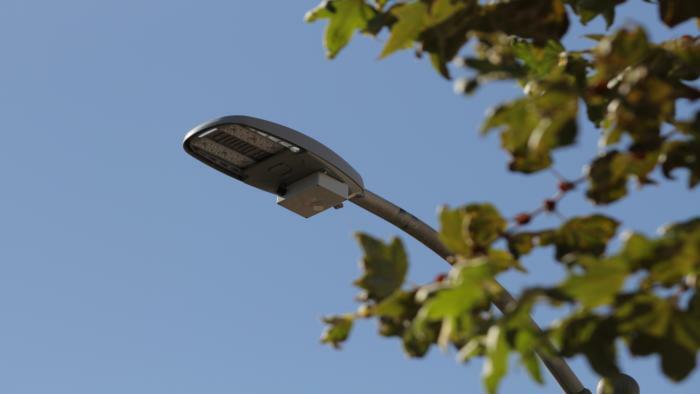 L.A. already has seen energy and repair savings by installing LED lighting on 170,000 of the city's 219,000 streetlights. For that project, begun in 2009, the city spent $65 million to retrofit older streetlights with efficient LED lights. Some of the newer models are expected to last up to 15 years. About $9 million a year has been saved in energy costs, Ebrahimian said. The city has also seen a dramatic drop in streetlight maintenance in the shift to LED, going from 24,000 repairs before the program started down to 10,000 last year. While the return on investment with LED lights is clear, Ebrahimian said there's no established financial ROI for the sensors that will be attached to street poles. Each sensor could cost $150 or more when installed. While the sensor benefits aren't directly measureable in dollars, they can bring other benefits because they will help city planners and elected officials respond more directly to city problems and citizen needs, he said. "Frankly, for all cities, you need someone at the top to be able to support sensor tech like this that is cutting edge," Ebrahimian said. "Mayor [Eric] Garcetti has given us amazing support. He's a tech person and embraces all this new technology and is excited by the LEDs and sensors and controls." Last year, Garcetti talked about the city's lighting and "smart pole" program at a conference, mentioning streetlight cameras that were then being used to spot illegal trash dumping. He also suggested that public Wi-Fi could be attached to city streetlights. "The mayor calls our streetlights 'information beacons' where data can be disseminated to fire and police and planning officials and the mayor or whoever, so the city can do data analysis and we can put it on a dashboard," Ebrahimian said. For other city governments weighing smart city technology, Ebrahimian advised not using any single manufacturer to provide sensors, controllers or LEDs. Cities need to perform their own rigorous evaluations of vendor products as well. Contracts should be kept to short terms, of one to two years, he added. "We don't give three to four year contracts," he added. "We don't trust everything manufacturers are claiming." However, Ebrahimian also said city governments "should jump on LED lighting" because LEDs are more than 80% more energy-efficient than older technology. "I don't understand why cities are so slow to implement LED," he said. "What is holding them back?" Philips Lighting, a division of Philips, first announced a partnership with the city of Los Angeles in 2015 to install smart poles that work with controllers and 4G LTE wireless from Ericsson. Last month at Mobile World Congress, the two companies announced a newer generation of the smart pole technology for use in European cities. Other vendors also showed smart light pole technology, including Verizon and AT&T. ShotSpotter makes sensors that can detect gunshot noises which can be put on streetlight poles and roofs. The company has deployments in 90 cities worldwide, including San Francisco.